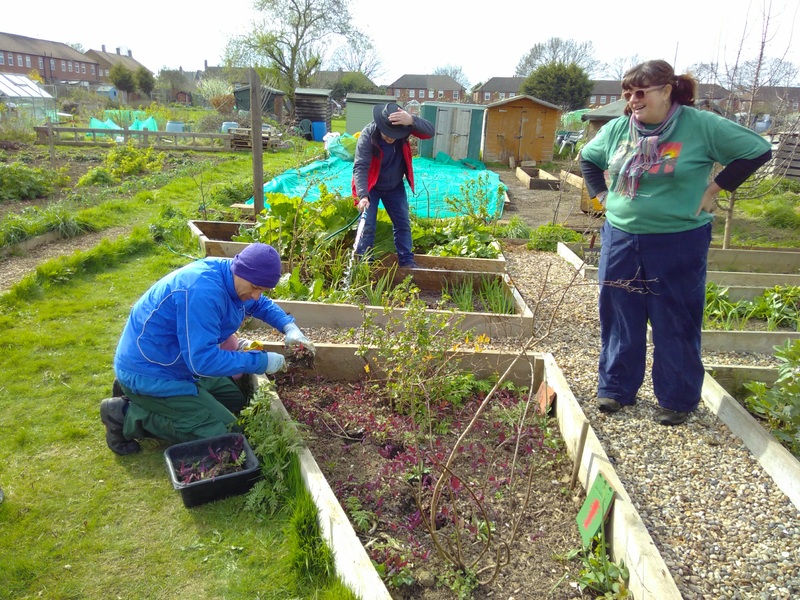 Some late pictures from a wonderful day on the plot. Thanks to LAB scaffolding for the donated boards. 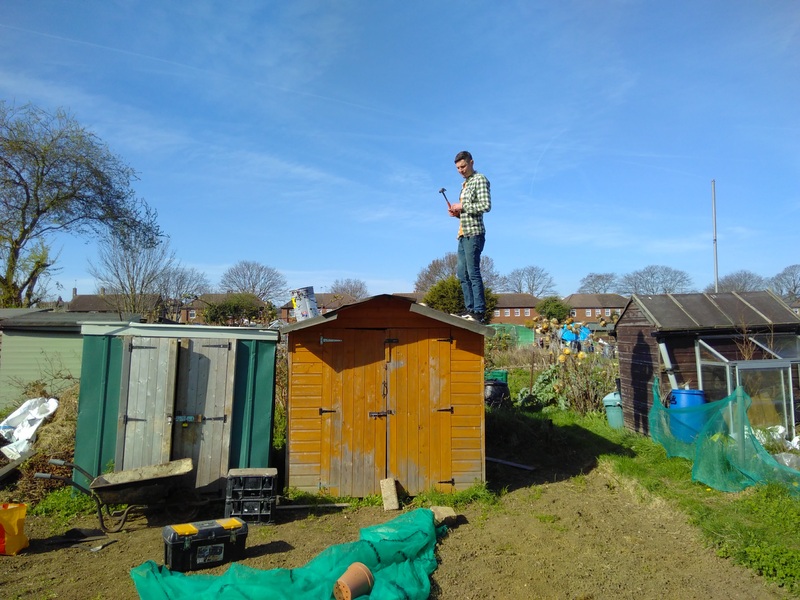 Planted potatoes and flowers in the new beds on the family plot under the watchful eye of Duncan working on the heights of the shed. 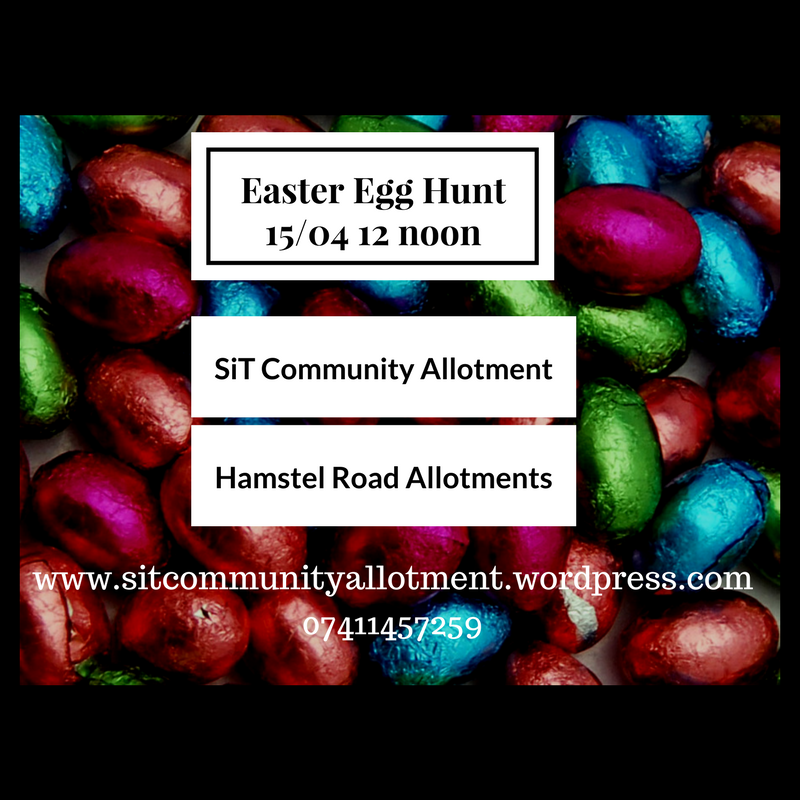 Enjoy some gardening and Easter Egg Hunt!! Bring the kiddies for 12 o’clock. Chocs are handmade locally by Sara and the Chocolate Factory. 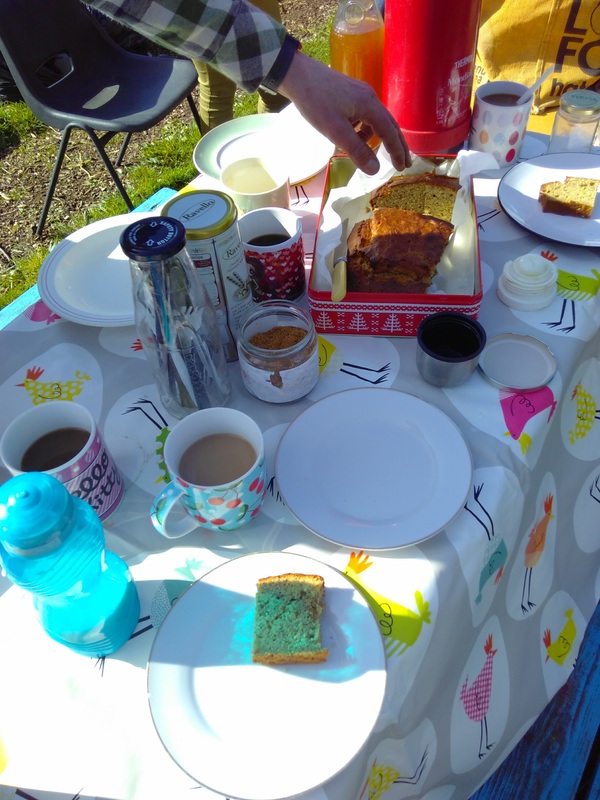 Social action hours put in by the volunteers and Trustees into running SiT, events and the plot since Sept 2016: 120 hrs. Thank you all. 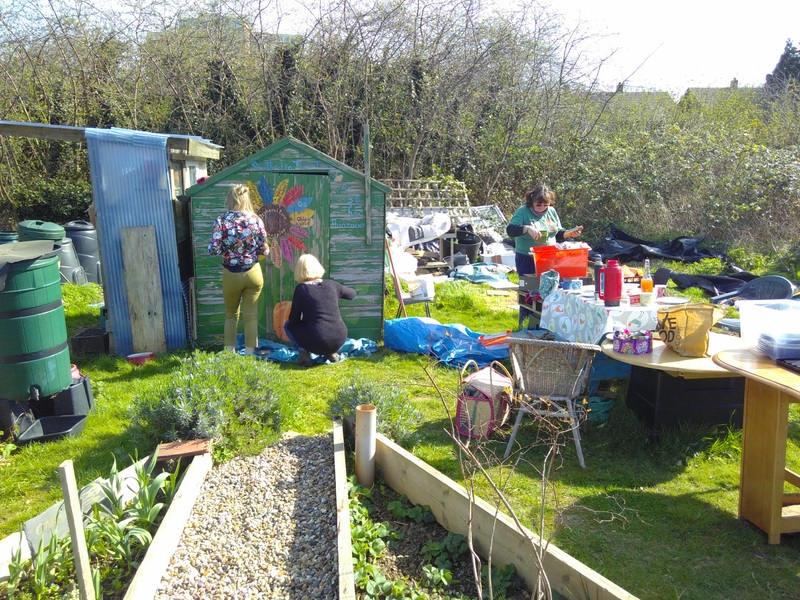 Gardening and the big paint job to prepare the sheds for a new season and…Seed Swap! Buy, sell, swap and donate seeds. Your regular varieties and some surprises. 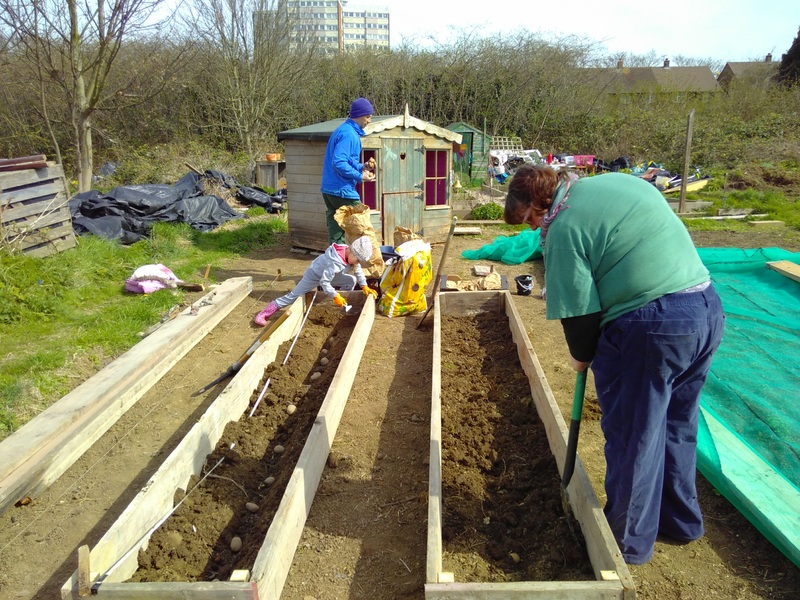 Southend in Transition supports the development of resilient and thriving communities and believes that local residents have the skills and talents needed for the big challenges and opportunities ahead. A perfect example of an organization enabling people to utilize their talents is Southend Time Bank. It allows local people to offer their skills to others and get 1 time credit for 1 hour of their time. In an exchange you can use your credits to request a skill from another time bank member. Tens, hundreds and thousands of exchanges of skills between strangers are happening daily around the globe without money made easy by time banks. What better then for Southend in Transition to join the Southend Time Bank so that our volunteers’ hours could be transformed into credits? We can use credits as individuals, they can be used by our organisation to request help with our projects from the time bank members or we could donate hours to other groups and individuals in need. You might ask how does it differ from regular volunteering? As people offer their skills on an hour by hour basis it might be easier for them to contribute as a one off or here and there rather then have to commit to regular help. It creates new connections between people who would not normally have a chance of interact which builds social capital in our community. It adds value to the volunteering and recognition of the effort people put in in helping others without monetizing people caring and sharing activity. With lots of skills on offer from DIY to computers we sent a few messages and got Pepe messaging back offering his DIY and gardening skills. There is always a lot to do on the plot to maintain it and another willing pair of hands is very welcome. Pepe visited the plot for an initial chat and returned twice so far to help with the weeding, planting and digging of the plot for which his account was credited with time credits. He has a wealth of other skills and we will find ways to utilize them as well in the coming months. It was great to meet and chat about community matters while getting our hands dirty and Pepe commented that the exchange helped him get to know another part of the community which he would otherwise not know about. With our volunteers signing to the local time bank we are looking forward to more exchanges and to get to know the other members of our time bank. Get in touch with Emily at SAVS if you wanted to find out more or you can do it online. Signing up is as simple as going onto this page, click on the Become a Member button on the left side, completed your contact details and details of two people willing to supply character references. Once they are processed you are in the game of creating a resilient and thriving community one hour at a time. Cheers to many surprising meetings of strangers no-more.